8th January, 2014: FISHING REPORT: Port Alberni Inlet, Barkley Sound, Ucluelet (West Coast), Somas-Stamp River System. It is the beginning of a new year and it is the time when many sport saltwater fishermen begin to think of the summer that is only a few short months away. Many of these individuals are thinking of the possibilities of some great fishing in warmer weather conditions. The late spring and summer salmon sport fishing in the many Pacific Rim areas in 2013 was actually quite phenomenal. We are expecting the same if not better results this summer. However we are currently in the dead of winter and the weather in much of Canada is very cold. The weather on Vancouver Island and the west coast has not been anywhere as bad but day time temperatures have been staying close to 0 degrees Celsius. There has definitely been a severe lack of precipitation however. Of course many realize that there is opportunity to fish twelve months of the year in this area of scenic Vancouver Island. Many anglers are currently enjoying the clear sunny but chilled weather on the Stamp River where they are fishing in a fresh water body for Winter Steelhead. Due to the lack of precipitation the Stamp River is very low and the Winter Steelhead fishing has been very inconsistent over the last three months. We are hoping for some January rain to bring the Stamp up which should begin moving Winter Steelhead into the system. Of course Barkley Sound which is predominately protected water and the open waters outside the Ucluelet Harbor have opportunity during the winter for hearty anglers to fish for Winter Chinook. These Chinook could also be referred to as residential fish and often average eight to twelve pounds and can often get up and over twenty pounds. The Winters Chinook also know as feeders rely and feed on the hearty and abundant rich resources of bait fish. The bait fish are found close to the surf line of Vancouver Island and the many small islands and large island chains of the Sound and also the many large sandy banks outside the Ucluelet Harbor. The pristine water of Barkley Sound and the inshore and offshore water off of Ucluelet are perhaps a couple of the only areas along British Columbia’s majestic coastline where sport anglers can have opportunity to salmon fish twelve months of the year and land a twenty plus pound salmon. 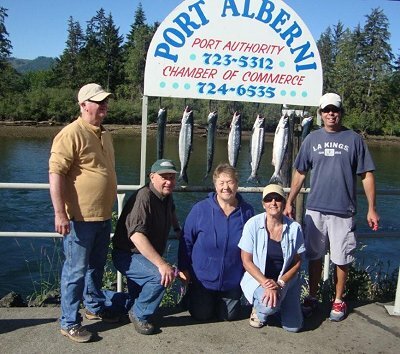 Most anglers think that the Port Alberni Inlet only has salmon fishing from mid June through mid September. This is true as the Sockeye, Chinook and Coho do return in big numbers to the Somass-Stamp River System right into late October. But one must remember that the Port Alberni Inlet stretches from the Port Alberni Harbor beyond Nahmint and Bilton Point which is quite a stretch of water. Few people realize that feeder Chinook do swim up into the Franklin-Nahmint area and feed on the big bait balls that school up during the winter in this area. During the winter high pressure systems that we have been experiencing move into the region and the feeder Chinook can really turn on and feed in frenzies. The few people that do fish the area on an on going basis during the winter do have some success in 100 to 140 feet of water using anchovy or coyote spoons. Hootchies also can be very productive but leader length can be a little longer than what is used in the summer. Hootchie leaders of 44 to 46 inches seem to be more productive for Winter Chinook in the Inlet and also in Barkley Sound behind hotspot green glow, purple haze, and chartreuse flashers during the winter. Barkley Sound has had a few bright spots over the last month. The Bamfield Harbor has had some nice fishing with the feeder Chinook averaging eight to ten pounds. The stretch of water from the harbor mouth down to Poetts Nook and into Sarita Bay has also had some good fishing when the bait has been in the area. Rainy Bay and also Vernon Bay have been on and off. “If the bait fish are there the feeders will be there”---is often the rule of thumb. Anchovy in a Chartreuse Rhys Davis Teaser Head has been working very well in the mentioned areas. The fish around Vernon Bay have been in 140 feet of water. Rainy Bay and Ecoole have also had winter feeders in very deep water. We expect the winter Chinook fishing to really pickup in February and March. The late spring and summer fishing in 2014 in both the Port Alberni Inlet and Barkley Sound looks unbelievably promising. In 2013 the sockeye returns to the Somass River were very low. The seasonal predictions for 2013 Sockeye were correct. The Sockeye returns for 2014 in preseason forecast is unbelievable with well over 1.2 million Sockeye salmon predicted to return to the system. The west coast Vancouver Island Coho returns and also the Somass River returns in 2013 were also remarkably high and were one of the highest returns of Coho salmon ever. Coho returns in 2014 are expected to be very similar to the 2013 returns. The West Coast Vancouver Island Chinook and returns back to the Somass River are expected to be average or just better than average. The La Nina weather pattern is continuing to influence the weather patterns over the Pacific North-West and the northern waters of the Pacific Ocean. This pattern has definitely played a major role on ocean conditions which over the last few years has produced higher salmon returns to many of the large watersheds in the Pacific north-west on both sides of the Canadian and U.S. borders. The La Nina pattern has produced a much lower salmon mortality rate as the salmon food resources have been increasingly better and ocean conditions for salmon survival pretty well perfect for all five salmon species to survive in Northern Pacific waters before returning to their streams, creeks and rivers. Ucluelet is one of those west coast British Columbia locations that anglers have opportunity to land a twenty pound salmon twelve months of the year. 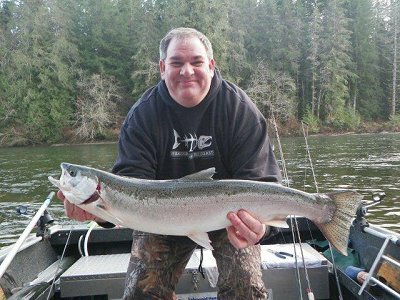 Of course weather plays a huge role on getting out onto the water but there are days during the winter months that are fishable close to the Ucluelet Harbor. Of course the summer months create different weather patterns and much of the fishing occurs on the rich bait resource sandy banks which begin at three miles and continue to twenty-six miles and further offshore from the Ucluelet Harbor. Those hearty winter anglers fishing close to Ucluelet during the late fall and early winter have been treating themselves to not only some of those hearty fat feeder Chinook but also to some wonderful crab and prawn resources found close to the Harbor basin. Anglers must beware of closure to sport crab and prawn fishing and continuously check the DFO regulations for sport shell seafood and when closures occur. January has already produced some spectacular winter days out on the west coast of Vancouver Island, B.C. This past week has had some much colder air temperatures but the afternoons have warmed up. The month of December was very similar with some great winter weather. The good weather patterns have also permitted opportunity for local anglers and the odd guide boat to get out on the water. Mara Rock, Beg Island, Great Bear, Sail Rock, and The Alley have all been fishable on some of these great weather days. These areas are all relatively close to the Ucluelet Harbor and those fisher persons going out onto the water can easily get back to the Harbor if the weather happens to quickly change. The feeder Chinook like any other area on the west coast will basically be found wherever the bait fish is found. There have been some good sized bait balls in the said locations but in much deeper water than what one would find perhaps during the summer. Coyote spoons in the three and a half inch have been working. Green-glo, cop car, and any chartreuse color seem to be working well behind a hotspot flasher. The feeder Chinook are feisty and seem to bite a little better when the high pressure systems move in and also in the mid-day. 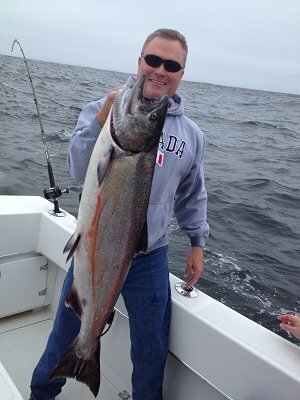 The Winter Chinook that have been landed are averaging nine and ten pounds but there are some bigger fish out there. As we get into February, March and April the fishing will get better. By April we will also see the beginning of the migratory flow to southern watersheds begin. These early Chinook are often fourteen to twenty pound and are extremely feisty. There will always be some fairly decent winter fishing on the west coast. Always take precaution just like the summer regarding weather conditions. The summers for salmon fishing out on the west coast have been phenomenal and the summer and late spring of 2014 should be no different. The fishing for Steelhead since the early fall on the Stamp River can easily be termed as being very inconsistent. The Upper River has been very mediocre most of the year and in the last few weeks the lower portions of the river have improved a little for winter Steelhead. The river over the past number of weeks has come way down which has made it a little easier for those on foot. For those walking the Falls Pool, Slide Pool, and Store Pool are all accessible on both sides of the river. These areas have been very busy on weekends and during the Christmas break. It will become very quiet again unless there is a change in the water level and new Winter Steelhead move into the system. The Sproat River has also been okay for those on foot. There seems to be a lot more fish in the Sproat this year than in the past. Those fishing with guides in boats have had some success. 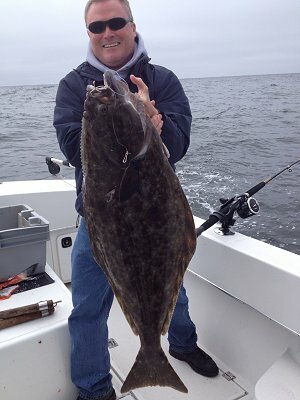 This is not to say that there are not a few days that are termed very good in terms of the fishing. If the fishermen are patient usually there is opportunity during the day to find biting fish. On average daily hookups over the past few weeks have been two to five. There has been the odd day with up to twelve and fifteen hookups. If using artificial four inch rubber worms in pink or white have been good as have rocket red spin-n-glos. 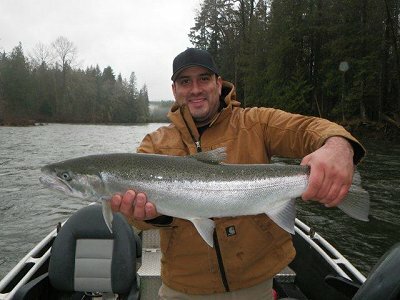 The Steelhead in the Lower River are averaging seven to nine pounds. There have been a few fresh fish. In fact some of the fish landed as of late have still had sea lice which means they just came into the system. Most of these fish have come in off a high tide. Those fishing above “the bucket” can only fish with artificials. Jigs have been good as have small gooey bobs, rubber worms and spin-n-glos. We are expecting some great fishing throughout the winter as soon as the rain comes. 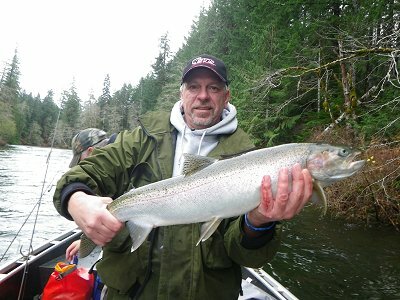 The winter Steelhead fishing can often continue right into April. The salmon fishing in the Somass-Stamp River which begins in September of each year is very popular. Those individuals wishing to fish the river in the fall should organize very soon.